RS Components has introduced new ranges of tools from Seeed Studio, Arduino and Bare Conductive that target academic institutions, including educators and students of electronics, as well as inspiring electronics design engineers with new projects and prototypes. The Grove series is a collection of single-function modules with standardised connectors. 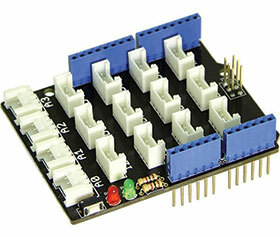 The system offers a user-friendly, building-block approach to simplify the building of circuits without solder or breadboards. Each module comes with documentation and demo codes. Grove starter kits also include expansion boards for microcontrollers such as the Arduino Uno and a selection of Grove modules. The BeagleBone Green is a Linux-based development board that is designed for fast interaction with general-purpose I/O and is based on the open-source hardware design of the BeagleBone Black. It includes two Grove connectors, enabling the connection of the board to sensors without requiring a daughter card. In addition, the Grove starter kit for BeagleBone Green contains ten modules and three step-by-step guides to help users quickly build their projects. The second product now available from RS is the Arduino Engineering Kit, which targets a range of users including students learning about engineering at a university or at a secondary school; engineering professors that want practical resources to demonstrate engineering concepts; and makers with an interest or background in engineering, either professionally or as a hobby. In conjunction with the Arduino online platform, the kit includes three Arduino-based projects to help students learn about fundamental engineering concepts, key aspects of mechatronics, and MATLAB and Simulink programming for system modelling and embedded algorithm development. Buildable projects in the kit include a self-balancing motorcycle, a mobile rover and a whiteboard drawing robot. The kit includes an easy-to-use Arduino MKR1000 board, several customised parts and a complete set of components required to assemble all three projects.